Gram-positive bacteria are those that are stained dark blue or violet by Gram staining. This is in contrast to Gram-negative bacteria, which cannot retain the crystal violet stain, instead taking up the counterstain (safranin or fuchsine) and appearing red or pink. Gram-positive organisms are able to retain the crystal violet stain because of the high amount of peptidoglycan in the cell wall (Figure 1). 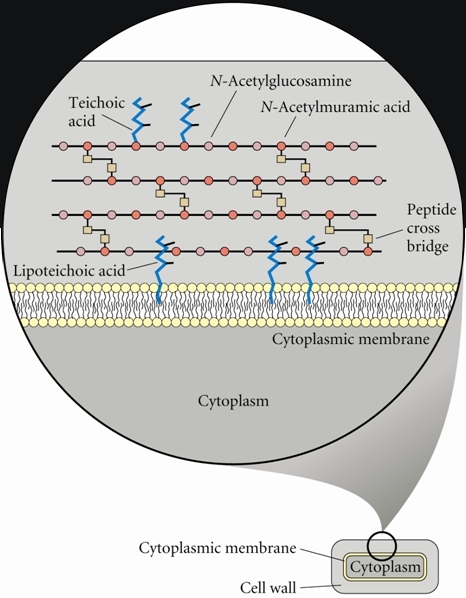 Gram-positive cell walls typically lack the outer membrane found in Gram-negative bacteria. Figure 1. Gram-positive bacterial cell wall components. Protection against Gram-positive bacterial infection: Antibodies produced by B lymphocytes such as immunoglobulin M (IgM) are effective against extracellular bacterial pathogens. Antibodies can defend against Gram-positive bacteria via opsonization; that is, antibodies specific for an antigen embedded in the cell wall coat the bacteria and neutralize their action. The antibody that is attached to the bacteria can also attach to phagocytes such as macrophages through Fc receptors on the phagocyte (Figure 2). This promotes phagocytosis and bacterial elimination. Recall that the tail portion of the antibody is referred to the FC (fragment crystallizable) region (Figure 3), and interacts with cell surface receptors. In addition, complement bound to bacteria can attach to phagocytes through complement receptors (CR), which promotes phagocytosis (Figure 2). Figure 2. 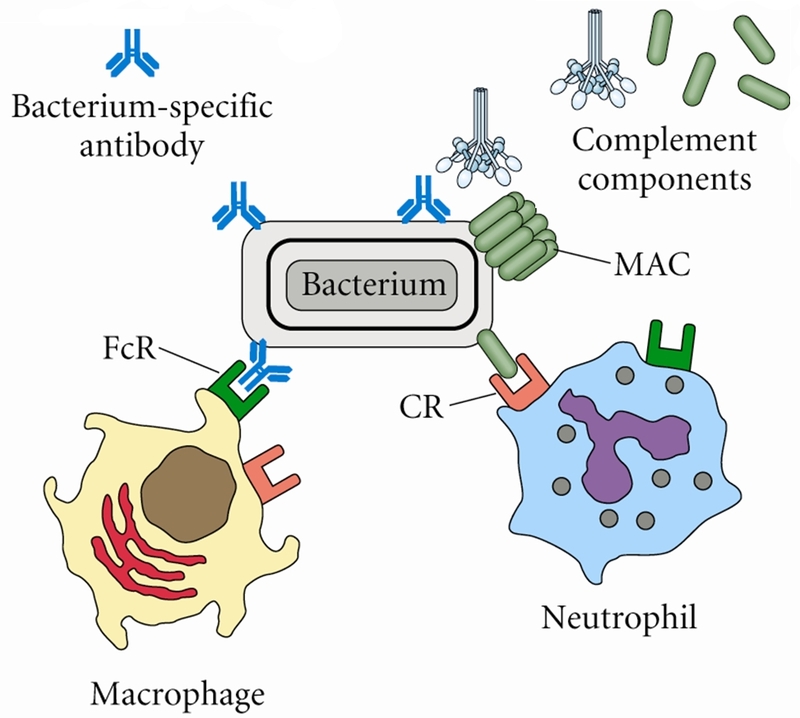 Examples of antibody-mediated mechanisms against Gram-positive bacterial infections. Figure 3. 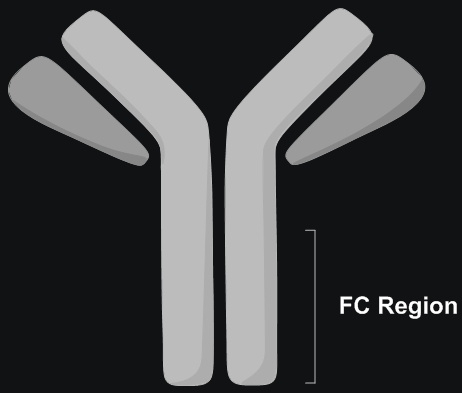 FC region of an antibody.